We’re making healthy chicken parmesan! I’m crusting the chicken with ground walnuts, a sprinkle of panko and parmesan cheese and serving it with zoodles or zucchini noodles. Low on the carbs and high on the protein! Let me just dive mouth first into this plateful of healthy chicken parmesan. 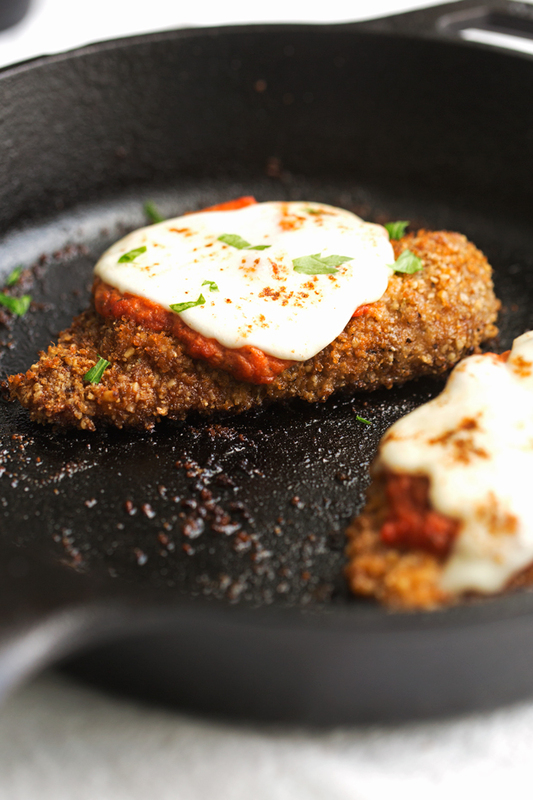 But first, we need to seriously talk about this walnut-crusted chicken parm recipe. I mean WHAT?! 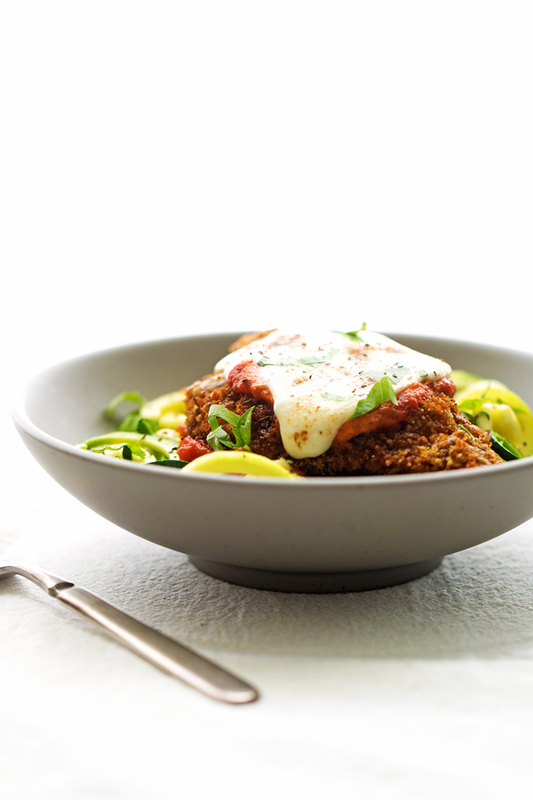 HEALTHY chicken parmesan? Is that even possible? 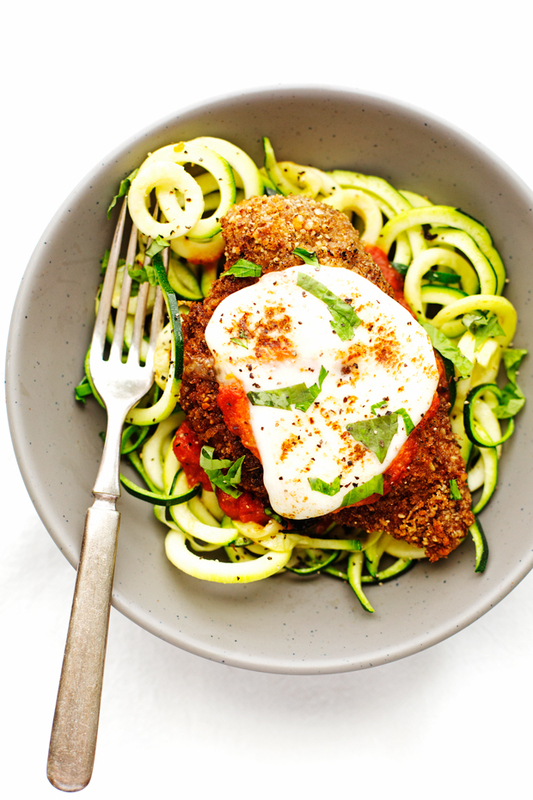 That’s right, it’s low on the carbs, high on the protein and serving it with zoodles or er.. um.. more normally known as zucchini noodles makes this one healthy chicken parmesan recipe! This recipe is a cinch to whip up and if you’re lightening fast in the kitchen it’ll take you around 30 minutes and only requires a handful of simple yet healthy ingredients. And if you’ve got picky eaters at home, you can easily swap the zoodles for actual spaghetti and still feel good about feeding them a nutritious meal because like a champ we’re coating the chicken in ground walnuts. As usual i’m running late getting on the ‘trend train’. I finally had a Strawberry Acai Refresher with coconut milk yesterday — or better known as the Starbucks Pink Drink. Have you tried it? What did you think? For me, it was just meh. I mean, yes it was a pink drink, and it did taste like strawberries but it also had an unpleasant underlying white or green tea flavor or something I can’t quite put my finger on. It was definitely just a one time thing. I can’t get over that odd tea flavor. Friends, was it just me? Anyone else not feelin’ it? And NOW i’m using the SPIRALIZER. I mean who am I right now? That’s right. It’s about time I jumped on that bandwagon! Half the internet has already freaked out over turning veggies into noodles and slurping them down like it’s nobodies business and here I am showing up late to the party once again. Truth be told I held out as long as I could. I just really wasn’t ready to wrap my head around a whole veggie going into a guillotine-like contraption and popping out in noodle form. Truth be told, i’m a girl that has REAL love for REAL noodles. And truth be told, i’m really starting to warm up to these zoodles. Especially when done on the ‘al dente’ side. Also super delicious, swoodles or sweet potato noodles. Here  is the one I have and LOVE incase you’re shopping around for one. The other main component of this healthy chicken parmesan recipe is the ground walnuts. I buy whole walnuts and just give them a quick run through the food processor. Along with that, i’m adding in a 1/4 cup of parmesan cheese and 1/2 cup of whole wheat panko bread crumbs. Also, it’s important to season the breading so the chicken is both juicy and flavorful. My go to is a little garlic powder and italian seasoning. Panko is an essential component to this recipe because it gives the chicken parm the perfect crunchy texture and the walnuts add an additional layer of protein while cutting out unnecessary carbs. It’s a quick work flow if you start the chicken parm on the stove top and let the crust get nice and toasty, finish it off in the oven topped with a little marinara and fresh mozzarella cheese and while all that’s going on start on the zoodles. If you’re into this whole raw food scene, then friends more power to you. 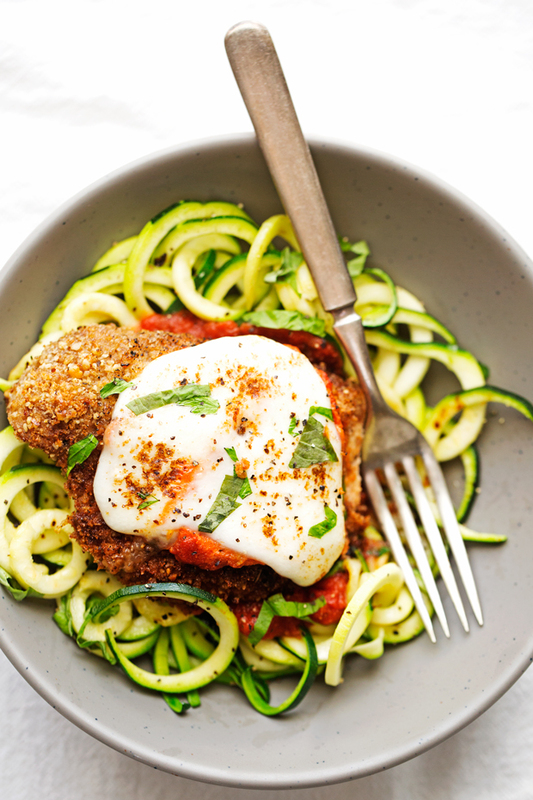 Spiralize and serve the chicken parm on top. For the rest of us that still need a little more convincing, I like to heat a teaspoon of oil in the a large skillet add the zucchini noodles and saute for a few minutes. You can add it a tablespoon of water and cover with a lid and just let them steam for a minute to get them nice and ‘al dente’ too. 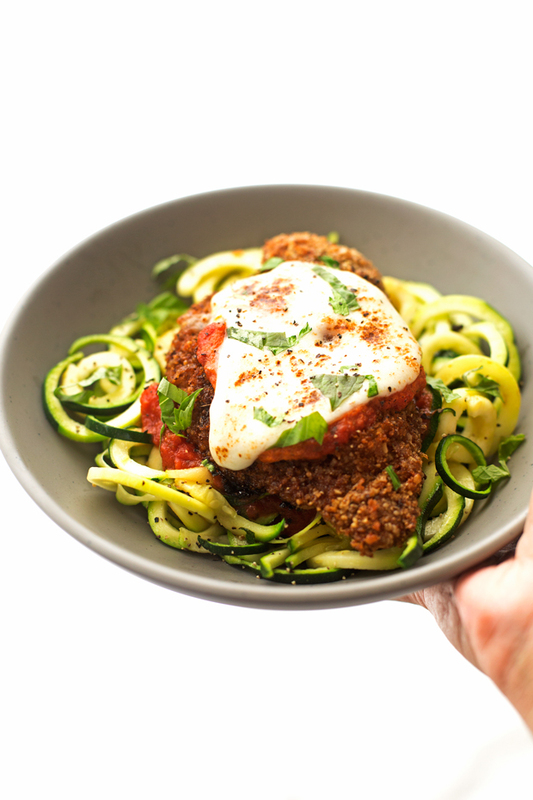 And if you just don’t think that healthy chicken parmesan has to be eaten with zoodles, then that’s okay too! Serve it up all on it’s own or on a bed of pasta. PREP: Position a rack in the center of the oven and preheat the oven to 425ºF. 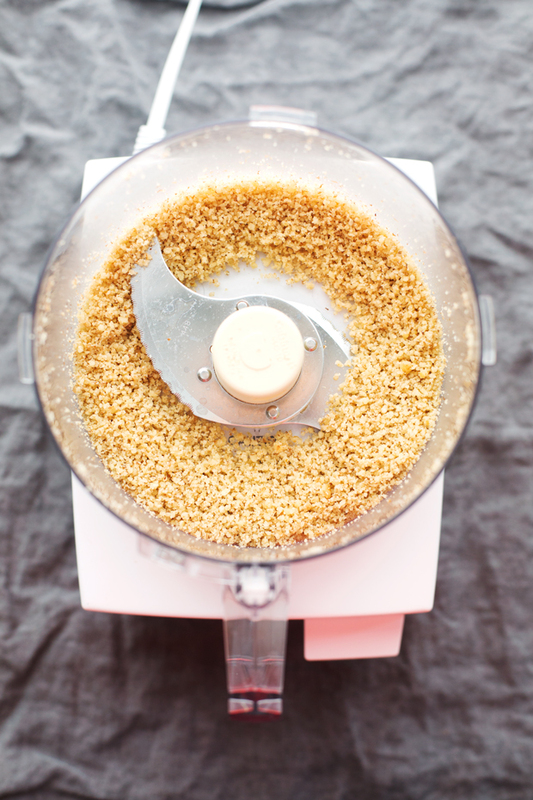 Pulse the walnuts in a food processor until they break down into panko-sized pieces. In a shallow bowl, combine the ground walnuts, panko, parmesan cheese, garlic powder, italian seasoning, a big pinch of salt, and black pepper. Toss to mix. CHICKEN:Heat the oil in a large oven-safe skillet over medium high heat. Dredge 2-3 pieces of the chicken in the prepared panko mixture and add the chicken pieces to the skillet. You can also do this in 2 skillets to make the process a lot faster. Cook for about 3-5 minutes per side. The breading should be browned on the outside, don’t worry if the chicken isn’t cooked through, we’ll finish it off in the oven. BAKE: Place the skillet in the oven and allow the chicken to cook through for 4-8 minutes. You’ll know the chicken is done when it feels firm to the touch. Top with a spoonful of marinara and a slice of the mozzarella cheese. Switch to the broiler and broil for about 1 minute or until the cheese gets nice and bubbly. 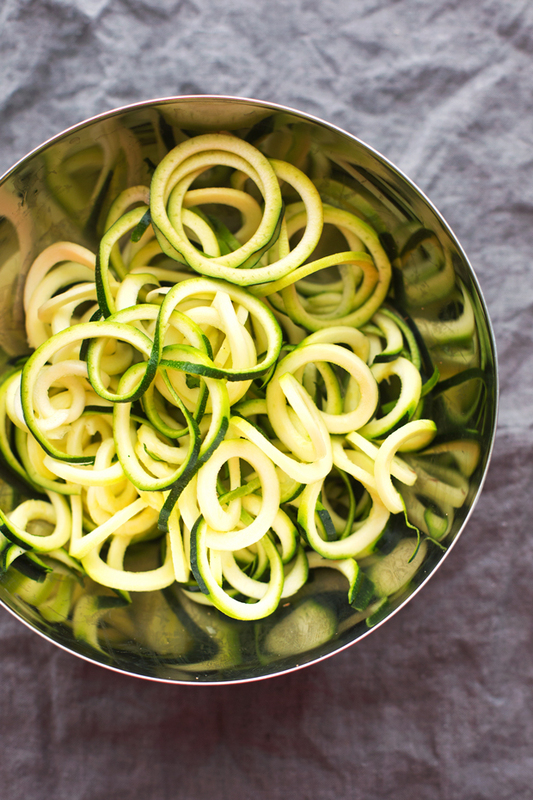 ZOODLES: While the chicken is baking (before the cheese step) add 1 teaspoon of oil to a skillet over medium heat, add the spiralized zucchini and allow to cook for 1-2 minutes. Drizzle a tablespoon of water and once it starts to sizzle cover with a lid for 1-2 minutes. 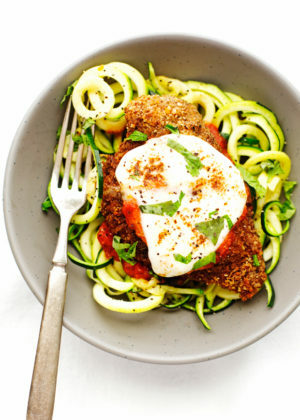 To finish, serve the zoodles topped with additional marinara (if desired) and prepared chicken parmesan on top. Sprinkle with basil if desired. Adding the marinara on the crispy chicken filet will make it a little less crunchy. If you want the chicken to be super crunchy, consider serving warm marinara on the side rather than topping the chicken and baking. 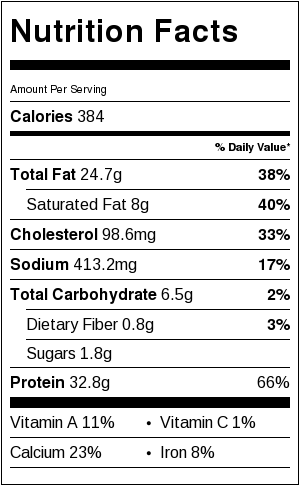 The nutritional facts do not include the zoodles as not everyone will want to serve it with them.